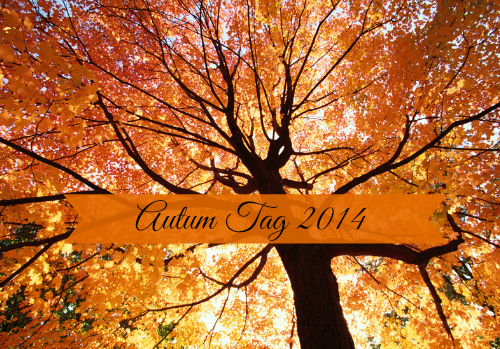 Beautiful You: The Autumn Tag 2014! I am hugely excited for Autumn/Winter this year, as it had started to get colder in the UK before we have had this week of weirdly hot weather, I decided to switch out my wardrobe from summer to A/W! This made me so happy as I am really loving black at the moment and being A/W gives me the perfect excuse to wear it all the time! I saw that Becca had done this post and seen as I am blogging everyday this week I thought that I would include this in there! What's your favourite seasonal drink from Starbucks/ Costa / Cafe Nero? I'm not a huge fan of hot drinks, I'll have the occasional hot chocolate here and there but I'm not overly fussed with them. However, I loved Costa's Christmas drink range last year so I cannot wait to see what they come up with this year as they haven't been released yet! Accessories - what do you opt for, scarves, boots or gloves? I love love love boots in the winter, they are perfect! They keep your feet warm, they look so nice and can easily be dressed up or down depending on occasion. I have bought some chunky rubber soled ones for Next and I cannot wait to wear them! I am also cannot wait to start wearing big chunky scarves, I bought one the other day from House of Fraser and it is dogtooth which is really in at the moment. It is just sitting in my wardrobe looking at me every time I go to get dressed begging me to wear it but it is just to hot still, I cannot wait to wear it! Music - what's your favourite music to listen to? Around this time of year a lot of new music is released as it is in time for people to buy it for Christmas and I love that! I don't really change up who I listen to unless someone or a band release new music, for example One Direction have just announced their new album 'Four' and of course I will listen to that when it comes out but I don't intentionally change my music just because its autumn. The only time I do change what I listen to is when Christmas music starts playing, then I listen to that a lot obviously! Candles - what scents will you be burning this season? I am about to move back to uni to start my second year and I wasn't allowed candles last year but as we are living in a house this year I have bought loads because I cannot wait to be able to burn them. I bought two from Yankee Candle, they are Red Velvet and Turquoise Sea, the latter of the two I bought because I am having a beach theme in my room this year and I thought it was quite fitting and then I just couldn't resist the Red Velvet one as the smell was to die for! Perfume - What is your favourite scent for this time of year? I always change up my scent when the seasons change and I go from quite a floral light scent such as Britney Spears Island Fantasy to something more heavy and musky like Rihanna's Rebel Fleur. I love this scent in the winter and the combination of smells just reminds me of that time of year and you can get away with a heavier scent in the winter. I love the fact that you can layer up, t-shirts, jumpers, a coat and a scarf, I love fashion in the AW time because its easier to create an effortless look. Especially this year because I love all the current trends, dogtooth print, oversized 'boyfriend' coats, subtle tartan, big chunky boots and so on, it all makes me extremely excited for this upcoming season. I am so excited to create lookbooks and outfit posts on here and my YouTube channel for you guys! I do love a good plum lip in the autumn, try and keep it plain on the eyes with a matt brown eye-shadow and a thin line of liquid liner on the upper lash line to give it a bit of definition and then a lot of mascara to really open up your eye! Then still keeping it simple on the cheeks with a orangey brown blusher on the apples of your checks and to finish of the look a bold plum lip, for instance MACs Rebel would be perfect! This is really cheesy and clique but I am really looking forward to the leaves changing colour and falling off the trees. I am also extremely lucky as I am going to New York in October and I cannot wait to see the city at that time of year, I have never been before and I am beyond looking forward to it. I hope you liked this tag, if you are looking forward to autumn as much as I am then do this tag and send me the link on twitter as I would love to read them! I hope you are enjoying this week of my blogging everyday and there are some exciting posts coming up next week as I am moving back to uni and I cannot wait to unpack everything! Hope you all have had a good week so far and that you have a good rest of your weeks, here's to the weekend! Autumn fashion is the best!